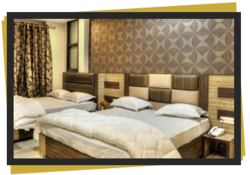 Hotel Puri Palace - Service Provider of luxury room, super luxury room & club room in Amritsar, Punjab. Hotel Puri Palace personifies the refined sophistication of modern luxury. 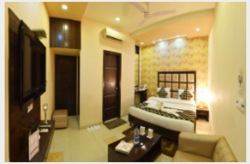 Hotel Puri Palace features 26 luxurious, Comfortable and well furnished Air Conditioned Rooms including Luxury Rooms, Super Luxury Rooms, Club Rooms, Royal Club Rooms. Each room and suites are elegantly designed with all ultra modern amenities and are decorated keeping in view the needs and comfort of the visiting guests. 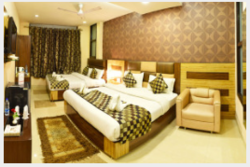 The rooms are fully air-conditioned with provision of satellite connected LCD TV’s and attached bathrooms and loaded with all the features like mini fridge , electric kettles, intercom , 24 hours hot and cold running water, 24 hours room service etc. 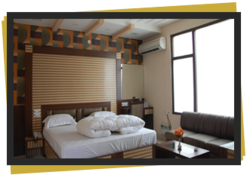 to make the stay of its visitors pleasant , comfortable and a memorable one. The hotel has professionally well trained staff which provides excellent service to its visitors for making their stay comfortable. 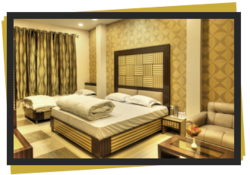 Hotel Puri Palace offers you some of the most delightful facilities and amenities inside the hotel premises for enhancing your leisure and comfort during your stay in the hotel. Nothing is too much trouble for the dedicated staff, who try to ensure that every guest leaves with the feeling in their mind that they were the most important person for the hotel and goes back with lifelong good memories and best impressions. From our interiors of bedrooms to interiors of suites and our restaurant, air conditioned roof top lounge specially designed in such a way so that you can eat , enjoy and relax in a rejuvenating atmosphere with multi cuisine mouth watering delicacies served round the clock complimenting the excellent services being provided in the hotel.